A bagpipe’s distinctive skirl sounded the start of the 2011 ordination Mass May 28 at the Cathedral of St. Paul, where five “young, eager men” — including a native of Scotland — became priests for the Archdiocese of St. Paul and Minneapolis. Archbishop John Nienstedt twice referred to these graduates of the St. Paul Seminary as young and eager before ordaining Fathers James Lannan, Jonathan Joseph Kelly, Cole Thomas Kracke, Nathan William LaLiberte and Anthony Joseph Martin O’Neill, the Scot. Be servant leaders, Archbishop Nienstedt urged, and know that you are earthen vessels, human like the rest of us. “Delegate, collaborate, share the burdens,” he said. “One of the great lessons of our time is that priests shouldn’t have to pastor the parish all by themselves,” and he urged the new priests to take advantage of the many talents of lay people. He noted, though, that “priesthood is not just one of many ecclesial ministries” but unique. Priests musts have a disciplined prayer life and a friendship with Jesus Christ, the archbishop said, and he urged the newly ordained to follow the lead of the late and newly Blessed Pope John Paul II in his deep devotion to the Blessed Virgin Mary. The archbishop thanked the new priests’ parents, family, parish priests and friends for supporting the men through the discernment and formation process. All of the new priests entered the seminary during the episcopal tenure of former Archbishop Harry Flynn, who was present in the sanctuary for their ordination. Archbishop Nienstedt extended a special note of gratitude to the archbishop-emeritus for “the influence you had on these men,” and a long applause sounded throughout the cathedral. 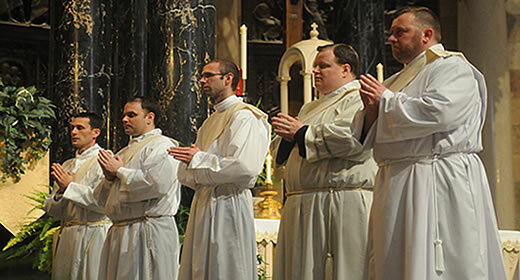 Five men were ordained priests for the Archdiocese of St. Paul and Minneapolis May 28 at the Cathedral of St. Paul. From left, Jonathan Kelly, Cole Kracke, Nathan LaLiberte, James Lannan and Tony O'Neill are presented for ordination to Archbishop John Nienstedt during the ordination Mass. After the liturgy, the newly ordained were stationed in various chapels of the cathedral to offer their blessings to, first, their parents, then family, friends and well-wishers. The bagpiper’s tones were a musical deference to Glasgow-born Father O’Neill. “He does Scotland great credit,” offered Stuart Hoarn, who took photographs as the new Father O’Neill offered his first blessing to his parents, Sean and Eilis, who traveled from Scotland for the ordination. His father Bob — brother of the late Father Patrick Lannan, a beloved St. Paul pastor — welled up with tears as he described with pride the path of life his son had chosen. The new Father Jonathan Kelly has what it takes to make that kind of priest, according to friends Kelly and Nancy Leahy, who worked with him on retreats and extreme faith camps. The new Father Nathan LaLiberte stood out among the Class of 2011, and not just because he is a head taller. From the moment he stepped into the main aisle at the processional, he had a smile on his face that beamed. His grandmother couldn’t help but notice. The smiling Father Tony O’Neill understood the feeling. The class of 2011 is the first ordination group that Father Robert Pish has had significant time to get to know in his post as vice rector of student affairs and dean of men at the St. Paul Seminary. As celebrations at the cathedral wound down, Father Pish reflected on the men who had just joined him in the ranks of archdiocesan priests. “One thing that seems amazing,” Father Pish said, “is the unique way God works in each of the men he calls to priesthood. No vocation is exactly the same, yet there is always this beautiful and personal relationship with Jesus Christ, and that is reflected in the business of what God calls every one of us to.